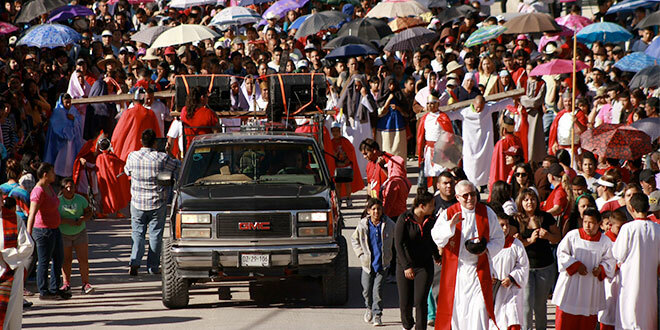 Leading in faith: Fr Kevin Mullins leads a Good Friday procession in Ciudad Juarez, Mexico. DRIVING through the desert in northern Mexico, Columban missionary Fr Kevin Mullins was stopped and held at gunpoint. “Three guys with ski masks, blue overalls and AK47s jumped out of a van, dragged me out of my car and held one of the AK47s to my temple,” Fr Mullins said. “And I thought it would be a shame for a young Queenslander to be killed off so soon. “My hands were trembling, but I was also hopeful. That broke the ice. Fr Mullins handed around cigarettes, and explained that he was the priest from down the hill in the local parish. “It was nerve-wracking for a while there,” he said. 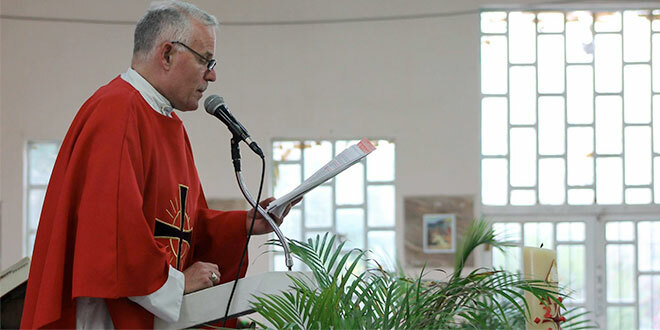 Fr Mullins, 63, is the priest of Corpus Christi Parish, Ciudad Juarez, which takes in the shanty towns of the northern Mexican region and extends to a massive steel fence at the United States border, making it a major point of entry for drugs into the US, and a haven for crime gangs. From 2008 to 2012, 13,500 people were executed in Ciudad Juarez, and it is infamously known as the murder capital of the world. Fr Mullins grew up as the son of a travelling magistrate in Queensland and can name a long list of towns in which he grew up. Mexico is now his home, and where his heart, and his mission lies. Fr Mullins has spent the past 16 years in Mexico as a missionary, and before that he was in Chile for 22 years. He has had numerous brushes with death. In Mexico at least 31 priests have been killed since 2006 – many of them brutally murdered. Fr Mullins recalls a priest stabbed to death in his own parish. The latest death, this month, was Fr Joaquin Hernandez Sifuentes, a parish priest kidnapped in the northern state of Coahuila. In a troubled world of gang violence and extortion – in countries like Mexico, Chile and Peru and even the southern Philippines – it’s open season on priests. Missionary priest: Fr Kevin Mullins. So why do missionary priests willingly tread a path of danger and possible death? “We sign up as missionaries because that’s what we think God is calling us to be,” Columban Father Gary Walker, the order’s regional director, based in Melbourne, with 45 years experience, said. Fr Walker is a Brisbane priest who started his formation at Brisbane’s seminary in Banyo, but discerned that his path was with the Columban missionaries. He was sent to Fiji, and later Jamaica, and has travelled extensively to some of the world’s most difficult and dangerous hotspots. “Nobody sets out to be in danger, but part of the bargain is that you are called by God to work in these places,” he said. Nearly 30 order missionaries, including one sister, have died since the Missionary Society of St Columban was founded in 1918 in Ireland for the evangelisation of China. The last Columban priest to die was Irishman Fr Rufus Halley, 57, who was shot and killed on his way home to his parish in Mindanao in the southern Philippines on August 28, 2001. He spent more than 20 years promoting ecumenical dialogue between Christians and Muslims and built bridges between the two faiths. “But some criminal gang decided to kidnap him. It wasn’t a religious gang. The kidnapping went wrong and he was shot and killed in the process,” Fr Walker said. Fr Walker said both Christians and Muslim, who were locked in civil war, mourned after Fr Halley’s death. He said Mindanao remained “quite a dangerous place”. Today more than 480 Columban priests and lay missionaries work in 16 countries. Australian Columbans have traditionally been sent to volatile nations in the Pacific rim – countries with a history of violence. Fr Walker visited Fr Mullins in 2012, and observed the brutal power of the outlaw gangs. “Of all the Columbans, Fr Mullins has seen more violence and real brutality than any other Columban priest I know,” Fr Walker said. “It hasn’t really dampened his spirit or got him down. “He knows exactly where the boundaries are … and exactly the path to tread. You stray outside the boundaries and you will be killed. Fr Walker said automatic gunfire could open up on the street at any time, signalling a renewal of the war between drug gangs, killing innocent people. 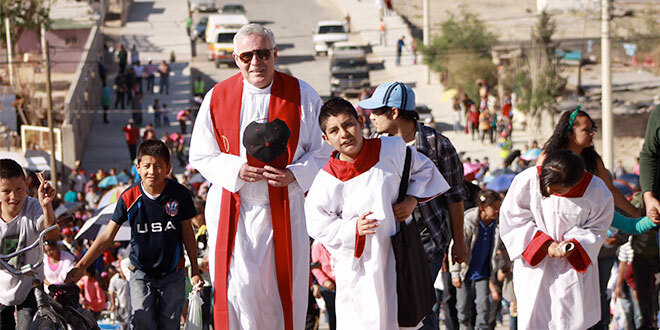 Faith leader: Fr Kevin Mullins leads a Good Friday procession through Ciudad Juarez, Mexico. During his trip to Mexico in February 2016, Pope Francis implored the country’s youth to stay away from the criminal underworld. “It is a lie to believe that the only way to be young is to entrust oneself to drug dealers or others who do nothing but sow destruction and death,” the Pope said. Between 2007 and 2014, drug gang violence claimed 164,000 lives in Mexico – more than the total number of civilian deaths from conflicts in Afghanistan and Iraq during the same period. Surrounded by such danger, Fr Mullins had no thoughts of abandoning the people of his parish. “We Columbans, we don’t leave places. We hang in there as shepherds and try to accompany people as best we can,” he said. “They are valiant people – brave, friendly, funny and hardworking. So I find the support of the people to be most wonderful. Fr Walker said the Columban charism was “a very strong commitment to the people”. “And that’s why our priests stay,” he said. “In places like Mexico, Chile, Peru, it’s the decent good people who have faith who inspire you, and then you help them by being in solidarity with them. “Fr Kevin has been there a long time. He’s buried a lot of people in the parish. “He’s wept with them, comforted them, and stood up with them. “He works for the parish, he works for the people. “If he started to agitate about drug dealers he could be killed no trouble at all. “And what would be the point of doing that? I mean the whole situation is totally out of control. Fr Mullins pointed to the inspirational example of Archbishop Oscar Romero, the El Salvadorian priest who spoke out against poverty, social injustice and torture. In 1980 he was assassinated while celebrating Mass. “I was in Chile when he was killed,” Fr Mullins said. “He was and is a great example of a bishop who was a shepherd to many people. Fr Mullins’ mission in Ciudad Juarez is nearing an end. He will return to Brisbane later this year and then take up a new Columban appointment in the US. However, he hopes to return to his first love, his parish in northern Mexico. “I’m very sad to leave and I hope it is only for a couple of years,” he said.